Shepherd University’s Archives and Special Collections serve the Shepherd University community and external researchers by acquiring, arranging, preserving, providing access to, and interpreting the permanent records of Shepherd University, and rare and unique materials that support the University’s administration, teaching, research, and outreach. The above mission statement covers not only the Shepherd University Archives but the West Virginia Archive and its special collections. 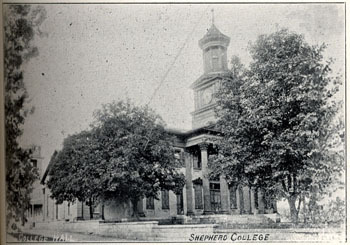 These two archive areas have two distinct focii: the Shepherd University Archive consist of records relating to the administrative, academic, social, and cultural history of Shepherd University since its creation in 1871. The West Virginia Archive contains books relating to the state of West Virginia's history, culture, and landscape. There is, in the collection, an emphasis on Jefferson and Berkeley counties' history. In addition to the books, the West Virginia Archive also provides space for several special collections, certain West Virginia-related journals, and other rare materials that do not circulate. Sunday 1 p.m.- 3 p.m.
Monday, Wednesday and Thursday 5 p.m.- 7 p.m.
Saturday 10 a.m.- 12 p.m. and 1 p.m. – 5 p.m.